Romitaman Original Comic Book Art :: Private Collection :: Tales To Astonish SOLD SOLD SOLD! by artist John Romita Sr. Check out this AWESOME, "HISTORIC" 1965 Silver Age full Splash page from Tales to Astonish #77, featuring the Incredible Hulk. On this 1965 Splash page, the Hulk goes up against the Executioner, a much used Thor villain. The layouts are by Jack "The King" Kirby and the pencils and inks are by the great John Romita! This piece right here is just the 3rd time John Romita penciled a SPLASH Page for Marvel Comics! (After Daredevil# 12 and 13) and this is the VERY first time John Romita EVER drew the INCREDIBLE HULK! Just a STUNNING SPLASH PAGE HERE FOLKS! This John Romita SPLASH (over Jack Kirby's layouts) was drawn 5 months BEFORE John Romita would start on his iconic run of Amazing Spider-Man with issue #39! 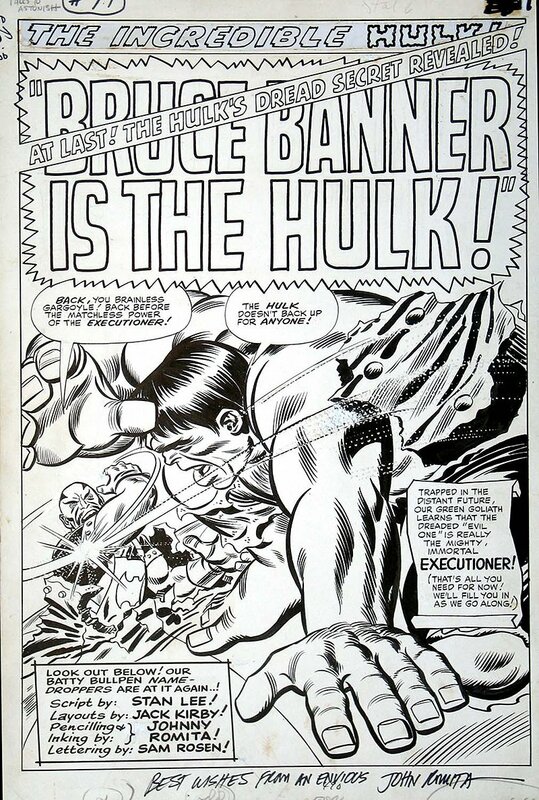 Large splash pages (like this)from 1965 are RARELY offered for public sale, So DON'T pass up this chance to get a HISTORIC beauty that will look great framed on your wall, with an image area of 12� x 18� on a much larger board! ALL HIGH end pieces of art, including this one, are able to be purchased with VERY fair time payment plan options, and trades are always considered towards this and any other pieces of art on my site here! Just send me an email and we can try to work something out.